"Emily and I just wanted to say a massive thank you for the firework display you created for us. It had everyone mesmerised from start to finish and we can't thank you enough. I will definately use your professional service for all future functions." 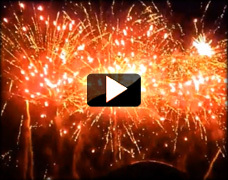 "We used Absolutely Fabulous Fireworks for our wedding. Wow what a display it was! All our guests were amazed and it really was the perfect way to end our day. I would definitely use them again at a big event." A true "Pyromusical" firework show is performed, when a musical sound track synchronises the fireworks, using a computerised firing system. We can custom design the sound track with the theme of your event (i.e. Music festival, Wedding, Bonfire Night, New Year's Eve, Birthday, etc. 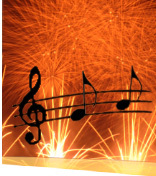 ), and the fireworks will reflect the feeling and manner of the music. NOTE: A Pyromusical show should not be confused with a Traditional show which is accompanied by music. Musical accompaniment will add to a traditional show, but it is not comparable to a Pyromusical show. Private Function or Corporate Events: £300.00 - £1,000.00 per min. High Profile Events: £1,000.00 - £2,000.00 per min. Competitions: £2,000.00 - £4,000.00 per min.